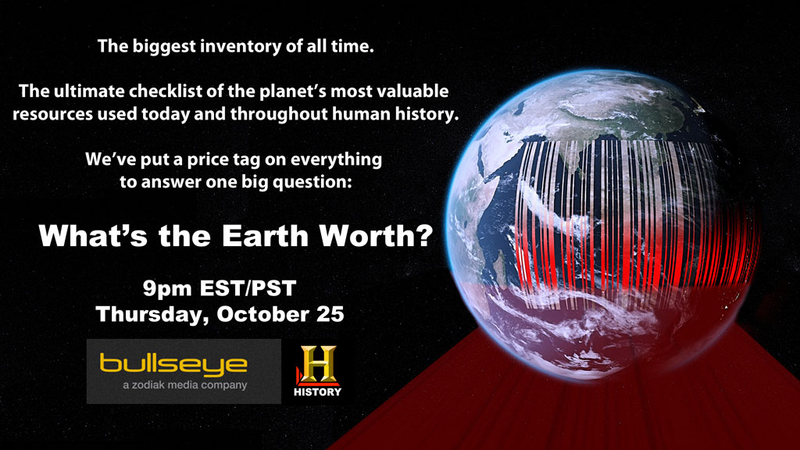 Hey everyone, check out a new program on the History Channel, What is the Earth Worth. It will air on Thursday October 25, 2012 at 9:00 PM EST/PST (8:00 PM Central); check your local listing. I was interviewed for a day in Seattle last spring for this program, by the production company, Bullseye Productions from Scotland. They have produced the program in association with IWC Media, a company in the Zodiac group of media companies. The program looks at the future of about eight vital earth resources and asks what they are worth. We’ll see how much of the footage they shot with me ended up in the final product, but it should be an interesting hour. Us it possible to get a look at what the break down on how much each raw material was worth. Jay, I am sure it is. At the end of the program there was a final listing of the totals. I’d have to watch and note them. Did you record the program by chance? If so, look at the last 10 minutes or so. You can also contact the producers by looking for Bullseye Productions (Scottland) and they can help. If this does not do it, let us know. The greatest tv show that is educational!!!! Is there anyway we can obtain a DVD on “What’s the earth worth? and how much would it cost? Rudy, check and see at the History Channel. I don’t know the answer.